Games like that one will kill you, eventually. You know that, right? The Tigers offense pulled off a minor miracle in last night's game against the Angels, rallying back from a 9-2 deficit to tie the game in the eighth inning -- a rally that included an Ian Kinsler grand slam and a "last call" at-bat by Victor Martinez that ended with a game-tying bomb. Hell, even Justin Upton hit a home run on this magical night. But then Mark Lowe puked all over himself, the mound, and the scorebook. Not that this really surprised anyone, except for maybe Brad Ausmus. Mark Lowe has been struggling mightily all month long, and this merry, merry month, opposing hitters had slashed .343/.422/.771 against him -- and that was before last night's implosion. Do the math: that's an OPS of 1.193 on the month, which makes it no surprise that his May ERA coming into last night's game was 10.38 ("was" is the key there, because that was before giving up a two-run walkoff dinger last night). Oh, there's plenty of blame to go around, don't you fret. You can glare in the direction of Anibal Sanchez, who only made it through three innings before giving up three home runs (yes, he's on pace to give up more dingers than he did last year in his league-leading campaign) and leaving the game with his team down 6-2. You can grind your teeth at Warwick Saupold, who was supposed to pitch some long relief and try to keep the Tigers in the hunt, but who instead gave up three more runs of his own and left with his team down 9-2. Just imagine if he'd done his job. Ian Kinsler's grand slam would have put the Tigers ahead instead of only bringing them to a one-run deficit. Or, what the hell, go ahead and be pissed off at Brad Ausmus for bringing Saupold into the game just three days after an outing in which Saupold coughed up five runs to the Oakland A's and only managed to record one out. The kid was just brought up from Triple A a few weeks ago to fill some space on the bullpen bench, and amazingly enough, he pitched exactly like a Triple A bench filler. 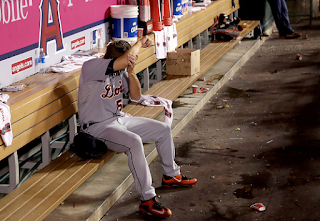 Be pissed off at Ausmus for bringing Lowe into a tie game in the bottom of the ninth with zero margin of error, when Lowe's outings all month long had been screaming "I'M NOT IN CONTROL OF MY GAME SOMEBODY PLEASE HELP ME." Why not K-Rod? Why not do what Mike Scioscia did last night and bring your closer into the tie game to make sure it stays tied? Oh, pshhh, that's easy -- it's conventional, old-school baseball, you never bring your closer into a tie game on the road, everybody knows that! Except, that's not "old-school baseball" at all. That's something of a recent development, something that only really started in the early-to-mid 1990's, after the notion of having a ninth-inning specialist really took root. And so I'll leave you with this anecdote from 1984, the last year the Tigers won a World Championship, as a reminder of how things used to be (and maybe could be again). The Tigers were in Cleveland, taking on the Indians at old Cleveland Stadium, and it wasn't going well. 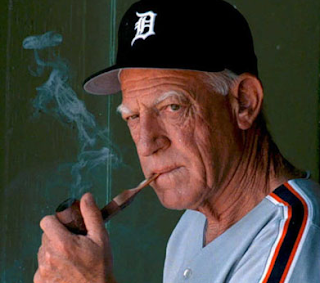 Starter Milt Wilcox only made it five innings and when he left, the Tigers were on the losing end of a 5-0 game. Dave Rozema pitched the sixth and seventh innings in middle relief, and that's when the tide turned. In the top of the eighth, the Tigers executed a fairly impressive comeback: Johhny Grub had homered in the sixth to make it 5-1, and now here in the eighth, with the bases loaded, back to back walks made it 5-3. Alan Trammell singled to score another run, and the tying run scored on a Kirk Gibson groundout. What do you do, Sparky? It's the eighth inning of a 5-5 game on the road. What now? He went to his relief ace, Willie Hernandez, because that's what you do when you want to keep your team in the game, regardless of whether you're at home or on the road. Hernandez pitched a scoreless eighth, and then came out and pitched a scoreless bottom of the ninth as well. The Tigers failed to score in the top of the tenth, so now what? Hernandez came right back out for his third inning of tie-game-on-the-road work, and pitched a 1-2-3 tenth. You see, not only was Sparky not afraid of using his closer in a tie game on the road, he also wasn't afraid to let his best bullpen arm pitch multiple innings when necessary to win a damned game. The Tigers didn't score in the top of the eleventh either, and three innings was about as far as Sparky wanted to push his Fireman -- so he went to his next-best arm, Aurelio Lopez. Notice the rudimentary, simplistic, common sense method of bullpen management here: first I use my best arm for as long as I can, then I go to my next-best arm. Lopez pitched a scoreless eleventh, the Tigers scored a go-ahead run in the twelfth, and rather than mess with a good thing, Sparky sent Lopez right back out to close the game in the bottom of the inning -- which he did. That's old-school bullpen management. What Brad Ausmus is doing isn't old-school. It's more like pre-school. I'll let Jeff Passan have the last word here, from his assessment of the way Ausmus and Buck Showalter managed their bullpens in the 2014 ALDS: "while managers around baseball play paint-by-numbers bullpen in October, Showalter showed in his first game this postseason he's doing calculus to their one-digit addition."